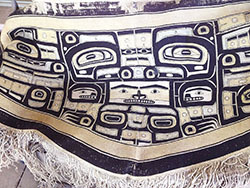 Sealaska Heritage Institute (SHI) has acquired a sacred Chilkat robe from an ebay seller, who willingly took a loss on the transaction so the piece could be repatriated to the Tlingit, Haida and Tsimshian. The robe appears to be a funerary object because of the frayed edges at the top where it may have been attached to a plank and fixture that was placed above a gravesite. The fraying has made the weft and warp visible, which will allow artists to examine the materials and technique the weaver used. SHI plans to convene a group of weavers to study the robe. It is a Raven design, but there is no record associating it with a clan or community. It measures just over five feet wide.